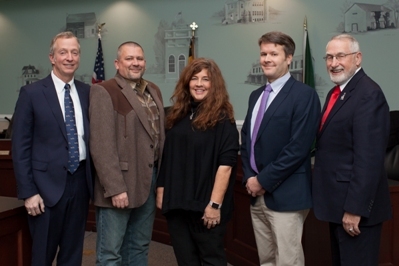 Thoughts and perspectives from the Poolesville Town Commissioners. Just a week ago it was perfect---a bright sunny morning with a light breeze blowing the grass that just seems to keep on growing stronger even though it’s October. Off in the distance I could hear children’s voices---our children’s voices---Poolesville’s children’s voices---having fun, enjoying the day, reminding me why happy kids can put a smile on even the most disagreeable person’s face. The voices got louder, then even louder, then finally there was enough noise to shake the dew off a solar panel. Poolesville Elementary School’s 5th grade classes had ARRIVED, and today was the day we were going to tour the solar array and our town’s waste-water treatment plant! If you’re doing it right, one of the “percs” of serving the town is getting the chance to interact with just about everyone----especially the kids. Either this particular group was on its game that day or almost all Poolesville kids are bright, respectful, and inquisitive (I think the latter), regardless, we shared a tremendous two hours of questions, stories, and basically a crash course on how environmentally proactive this town is (and how much these kids---our future environmental stewards---actually do “get it”). The solar panels were easy to talk about, and I have to admit I was surprised how many of our “yutes” had not gotten up close and personal with a solar panel. That needs to change. They easily made the connection between the solar panels, what it took to get them in place (both in labor and in cost), and our other environmental and energy saving initiatives (like LED streetlights, more efficient operations, etc). It was also an easy transition from harvesting solar energy to demonstrating how we use it to operate our town facilities. Once the gaggle of students landed at the top of the basins in our modern wastewater treatment plant (WWTP), the “stuff” started to run downhill, both literally and figuratively. I figured there would be plenty of “poop” jokes to be had (and I wasn’t disappointed), but our Poolesville prodigies were quickly ready to dig deep into the process of how our two plant operators (and resident microbe specialists), Matt Haga and Paul Lucia, introduced and regulated the “bugs” that do the heavy lifting as the town turns wastewater into regular water. The students also now most likely have a permanent aversion to “cake” (ask your 5th grader). Our plant is truly a marvel, and my hat is off to Matt, Paul, and Town Manager Wade Yost for making it look seamless. My stint with the 5th graders ended way too early as we high-fived (and scrubbed with hand disinfectant) away from the solar array and WWTP. While the town has done an admirable and increasingly progressive job of becoming more energy efficient (and thus “green”), I have to say I’m even more impressed with how Poolesville kids really seem to care about how we’re taking care of business (including their “business”). The future of Poolesville seems to be in very good hands. Thanks to our town staff as well as our wonderful PES 5th grade teachers for organizing a spectacular experience for all.